Dear Aspirants, Quantitative Aptitude plays a crucial role in Banking and all other competitive exams. To enrich your preparation, here we have provided New Pattern Aptitude Questions for IBPS Clerk Mains. Candidates those who are going to appear in IBPS Clerk Mains can practice these questions daily and make your preparation effective. Note: Dear IG ‘ians, Once Again IBPS Guide Team has brought you here with a New Innovative, to make you understand the questions more easier we have started providing Video Solutions for the questions. Practice here & click the link given below to check the video solutions of the same questions. Make use of it & thanks for your love. Directions (Q. 1 - 5): The questions below are based on the given Series-I. The series-I satisfy a certain pattern, follow the same pattern in Series-II and answer the questions given below. II) 36……148. If 148 is nth term, then find the value of n? II) 16 …….. 881.25. If 881.25 is nth term, then what value should come in place of (n – 3)th term? II) 238 ……. 373. If 373 is nth term, then find the value of n? II) 890 …… 25.875. If 25.875 is nth term, then find the value of n? II) 752, 773 ……. 1453. If 1453 is nth term, then what value should come in place of (n-2)th term? Directions (Q. 6 - 10): Study the following information carefully and answer the given questions: The given bar graph shows the percentage distribution of the area of six different shapes and the total area is 2200 cm2. Find the perimeter of the rectangle? Statement I: If the breadth of the rectangle is equal to the radius of the cone. Statement II: Length of the cone is equal to the radius of the circle. Statement III: Length of the rectangle is equal to the side of the square. So, Statement I alone is not sufficient to the answer the question. So, Statement II alone is not sufficient to the answer the question. Statement I and II are sufficient to answer the question. Statement III are sufficient to answer the question. Find the volume of sphere? Quantity I: If the volume of the sphere is equal to the volume of the cone. Ratio of length and height of cone is 7 : 5 and the radius of the cone is equal to the side of the square. Quantity II: If the radius of the circle is equal to the radius of the sphere. What is the ratio of the volume of cylinder to the volume of the cuboid? Statement I: Height of the cylinder is 120% of the radius of the cylinder. Base, Length and height of the cuboid are 12cm, 9cm and 20cm respectively. Statement II: Base of the cuboid is same as the side of the square and length and height of the cuboid is equal. Radius of the cylinder is two-seventh of the radius of the circle. So, Statement I alone is sufficient to the answer the question. Find the height of the cone? Statement I: If the radius of the cone is 50% of the radius of the circle. Statement II: If the length of the cone is 150% of the radius of the circle. So, Statement II alone is sufficient to the answer the question. 10. What is the difference between the area of rectangle and cuboid together and the area of the square and cylinder together? Directions (Q. 1 – 5): The questions below are based on the given Series-I. The series-I satisfy a certain pattern, follow the same pattern in Series-II and answer the questions given below. 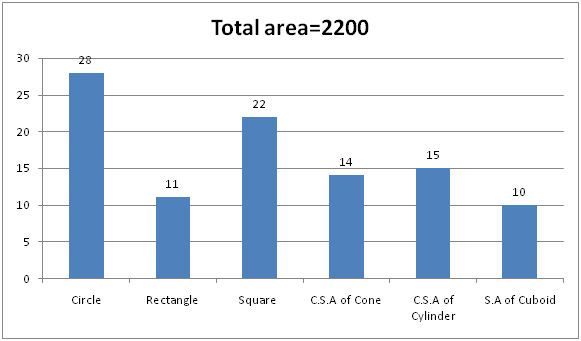 The given bar graph shows the percentage distribution of the area of six different shapes and the total area is 2200 cm2. 6) Find the perimeter of the rectangle? 7) Find the volume of sphere? 8) What is the ratio of the volume of cylinder to the volume of the cuboid? 9) Find the height of the cone? 10) What is the difference between the area of rectangle and cuboid together and the area of the square and cylinder together?